Do you want to plan the perfect date but you’re running low on ideas? Here are some questions you can use to help you brainstorm a long list of perfect date ideas! When brainstorming, write down every idea even if it seems too big, too small or too silly. One big idea could turn into ideas for a few smaller dates. Let your creativity run wild and you’re sure to come up with some great ideas. 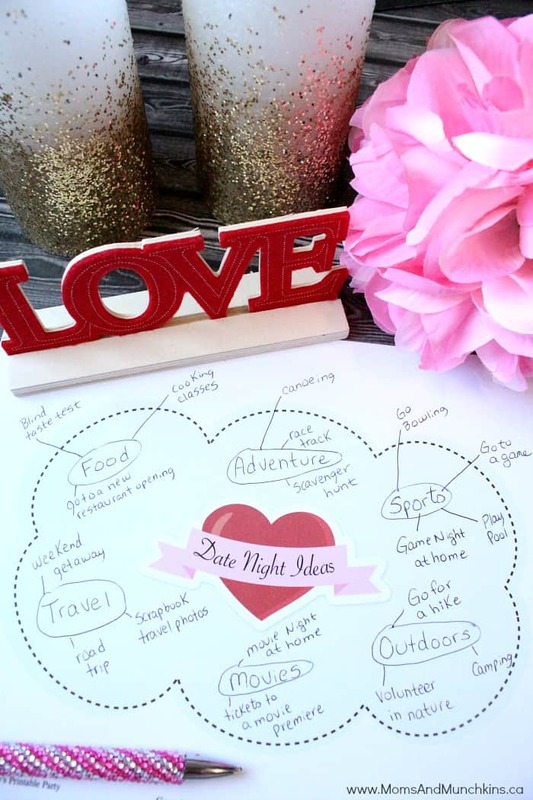 We also have a free Date Night Brainstorming printable worksheet you can use! What are her hobbies? If it’s art, is there an art museum you could go to? How about an art studio that you could try together? A romantic and fun idea would be to create a piece of art together to display in your home. What is his favorite sports team? Does this team play in your city? If so, you could attend a game together. If not, you could set up your own mini game at home with the sport colors, logo and a concession stand. As an example, see this hockey date night I planned for my husband. Is there a place that she wants to travel to? If Hawaii is on her list of places to visit, plan a special luau at home with decor and special Hawaiian themed meals. Is there an adventure that he’d like to try? Perhaps rock climbing or white water rafting are on his wish list of adventures. You could try to find a place in or around your city that offers these experiences. Do you have any perfect date ideas to share here to give the rest of us inspiration? What is the best date you’ve ever been on? For more date ideas plus FREE printables, visit our special Date Night page. Stay updated on the latest ideas by following us on Facebook, Twitter, and Pinterest with sneak peeks on Instagram. *A special thank you to Wendy’s Printable Party for designing this for us and Erin Bradley Designs for the cute clipart.